New Military Automatic from Davosa.Davosa watch company announces a new product called Military Automatic. 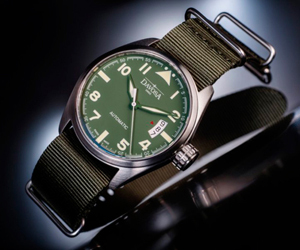 Davosa watch company announces a new product called Military Automatic. A model of the original design, made in military style. Hours are in a round housing with a diameter of 40 mm brushed stainless steel. Water Resistant – 200 meters. Dial khaki or matte black is equipped with Arabic numerals, hour-markers, hour and minute hands, which are covered with fluorescent material is white. At the 3 o’clock position is a large aperture date with a small arrow in red. Company logo adorns the dial Davosa at 12 o’clock. Protects the domed sapphire crystal dial. New Military Automatic equipped with Swiss ETA 2824-2 automatic movement with the functions: hours, minutes, seconds, date. Come watch the strap khaki, made in the style of NATO or leather strap with waterproof laminated. Military Automatic Watches buy from a company you can Davosa for 598 euros.